I have been extremely privileged throughout my life to meet a lot of people considered famous either as athletes, musicians, actors, political figures etc. But none have filled me with the feeling of Awe that Ali did. When he entered the room at a charity function I was attending in Los Angeles, I was immediately moved by the mystic of the moment! I could feel his energy and aura all across the room and was overwhelmed with goose bumps! I knew that I was meeting one of the most recognizable human beings in the history of our planet! A man who has always thrived in the spotlight had my full attention on this particular evening and was as graceful of a person I have ever come across. It is an honor that I will never forget; the night that I made the acquaintance of the one simply known as The Greatest! 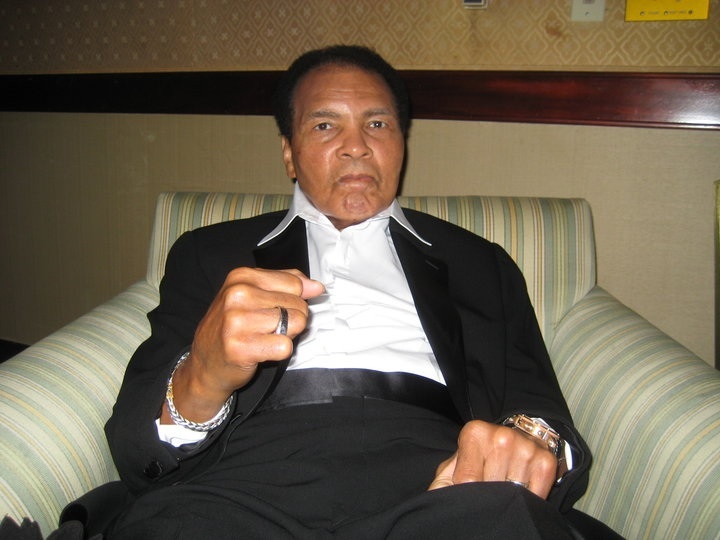 For more information on the champ visit: Ali.com. This entry was posted in Education, Inspiration and tagged Ali, Freedom of religion, Greatest, Los Angeles, Muhammad Ali, Social change, United States. Bookmark the permalink.